A day after President Donald Trump urged the Palestinian Authority to renew direct negotiations with Israel, Prime Minister Binyamin Netanyahu said the PA’s leadership must end its policy of funding jailed terrorists and make a serious commitment to peace for a final status agreement to be achieved. During a sit-down with Netanyahu Monday, President Trump called on PA chief Mahmoud Abbas to return to the negotiating table, even as he acknowledged the possibility that the negotiating process, moribund since 2014, could not be restarted. "The Palestinians, I think, are wanting to come back to the table very badly," Trump said during his meeting with Netanyahu at the White House. 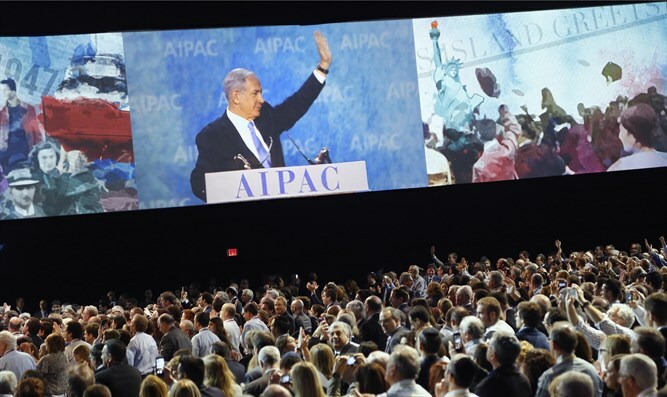 Speaking at the annual American Israel Public Affairs Committee conference in Washington on Tuesday, Netanyahu called on the PA chairman to “embrace peace” and end the PA’s policy of funding terrorists serving out prison terms in Israeli jails. "To get peace, [PA] President Abbas has to embrace peace and to stop supporting terror." "[Abbas] pays about $350 million a year to terrorists and their families each year. That's a little less than 10% of the total Palestinian budget. That’s an incredible number." Even convicted murderers received stipends from the PA, Netanyahu pointed out, including the terrorists responsible for the horrific “Itamar massacre” in the Samaria community of the same name in 2011. In the attack, five members of the Fogel family – including three children – were slaughtered in their home by a pair of PA terrorists.